WASHINGTON, DC - FEBRUARY 8: Bobby Portis #5 of the Washington Wizards smiles after the game against the Cleveland Cavaliers on February 8, 2019 at Capital One Arena in Washington, DC. The first game after the trade deadline can always be a bit of a wild card with new additions to rosters. 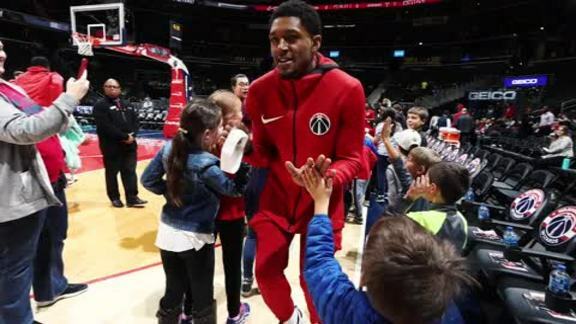 For the Wizards, Friday was a night of new beginnings after two trades brought in a trio of new players to the rotation. With All-Star guard Bradley Beal playing his usual leadership role, the new members of the team fit right in, contributing heavily to a 119-106 victory over the Cavaliers in D.C.
Washington was looking to break even on the season after a pair of losses in Cleveland this year, and new forward Bobby Portis (acquired with Jabari Parker in a trade that sent Otto Porter Jr. to Chicago) wasted no time in contributing to the effort. Portis scored 16 points of his team-high 30 points in the first quarter, helping the Wizards jump out to a quick 14-point lead. By halftime, Beal (25 points, 13 assists) and Thomas Bryant (13 points) were also in on the scoring barrage, tallying 22 points combined before the break and helping the Wizards to an 18-point lead. After hitting 68% of their field goals (66.7% from 3-point range) in the first, Washington was shooting 56.5% from the field at the halfway point. 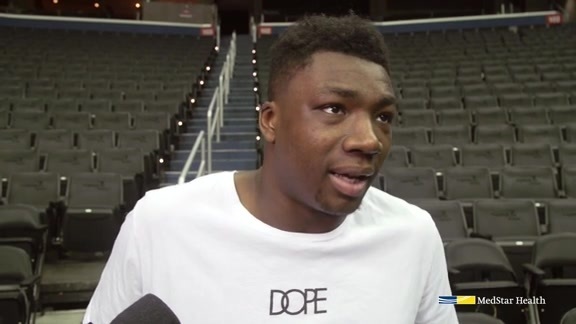 The Wizards finished shooting 50% from the field and 34.3% from deep, assisting on 35 of their 46 made field goals. Speeding up the Cavs was a big part of the Wizards’ success on the night, as they doubled up Cleveland 20-10 in fast break points. Washington used it to get out to a 20-point lead in the third quarter before the Cavs made a 18-3 run with some pace of their own to storm back and cut their deficit to just five. Collin Sexton (27 points on the night) and Jordan Clarkson (24 points) led the charge back and eventually chipped the Wizards’ lead down to just three. Star forward Kevin Love also made his return to the Cleveland lineup, playing just over six minutes in his season debut. Still, Washington proved to be too much down the stretch. Portis led the way in the final 12 minutes, scoring 10 points and adding five rebounds in the frame to help push the Wizards’ lead back into double-digits with just over six minutes remaining. He and Trevor Ariza hit critical 3-pointers in back-to-back possessions to put Washington up 13 with 5:35 left. While Portis and Beal shoulders a big portion of the scoring workload, they weren’t alone in double-figures. Jeff Green tallied 15 points and eight rebounds, while Ariza added 14 points and three steals. Parker, Portis’ teammate in the trade with Chicago, showed every bit of what made him a top pick (2nd overall) in the 2014 NBA Draft. He only scored seven points, but he also recorded 11 rebounds, nine assists and three steals Friday. Together, Portis and Parker proved that they can make a major impact on the Wizards as they look to ramp up a playoff run. 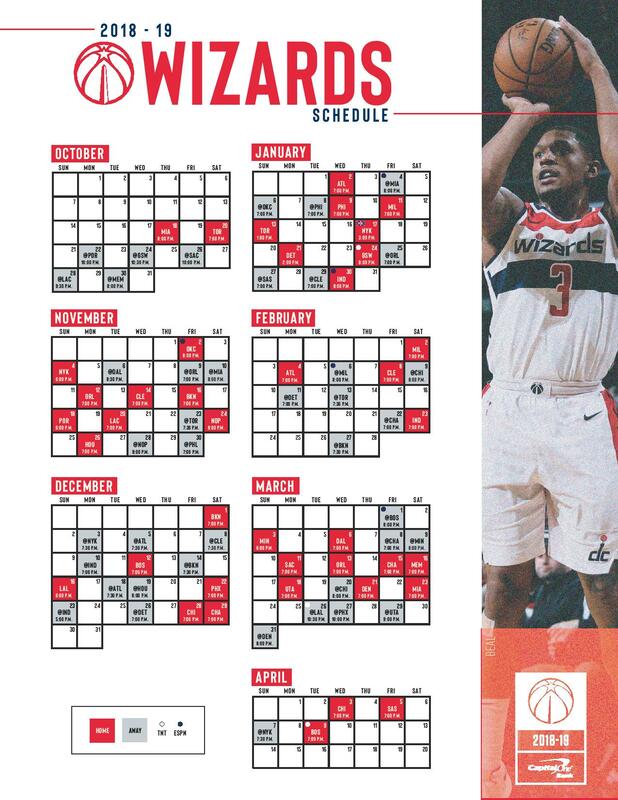 A three-game road trip before the All-Star break is next on the docket for the Wizards. It gets started Saturday night in Chicago with tip-off against the Bulls scheduled for 8:00 P.M. ET.